This is the advice of a wonderfully wise Primary Spirit Guide during an Insight Reading just last week. The serendipitous timing was not lost on me! The Primary Spirit Guide addressed what was on both my mind (writing this blog) and my client’s. He sought to encourage all those on the cusp of a spiritual awakening. A spiritual awakening is a response to an inner calling that jolts you out of your comfort zone and creates a shift in your consciousness. A spiritual awakening heralds a period of unprecedented change and transformation that changes you forever. A spiritual awakening is about self-realisation. Realise that you have the power to be who you truly are. Recognise who you choose to be and the parts of you that no longer resonate crumble away. Realise that you are an expression of the Divine. Realise that you are a timeless, eternal, non-physical being of love and light. A spiritual awakening serves to assist you to prepare for the higher vibration energy of the Earth and nudges you to let go of anything that is no longer true to who you are and align with your true self – your authentic, fearless, creative and unconditionally loving aspect that knows no limitation or separation from spirit. A spiritual awakening directs and assists in attuning your body to a higher vibration and to channel more light. After a spiritual awakening the Divine and higher self floods the soul and body with Divine Light, entering the body at the crown and travelling through to the base chakra. Organs and glands associated with the chakras are affected causing temporary imbalances and discomfort. You may feel various sensations such as heat at the top of your head, pressure and tightness in your heart and solar plexus, tightness in your throat. Your energy field lightens and purifies, making you literally glow with health and wellbeing. You have raised your vibration so you may feel drawn to eat differently. Your food preferences may become ‘lighter’ and you may feel that you are more in tune with your body. Coffee and alcohol may affect you adversely and no longer seem as attractive. When newly awakened everything is new and amazing! The world is alive with magic! Your senses and emotions are intensified, colours more vivid, sounds are filtered differently and sometimes there’s buzzing or high pitched noises in your ears. You may be hypersensitive. Suddenly watching the news is a harrowing, tearful ordeal as you empathise with all those suffering. Sometimes all these emotions may feel overwhelming or scary. All that’s needed is for you to ask your spirit guides to take it down a notch, to go easy on your for a bit to give you a chance to adjust to all the changes. Initially your spiritual awakening might manifest as a feeling of restless and desire movement or change in aspects of your life that no longer fit as comfortably as before: aspects of your life that no longer serve your highest good. A spiritual awakening can be a painful, messy, scary process if your life has led you far from your soul’s highest path and purpose. It demands nothing more than inner and outer transformation. It will mean a reassessment of everything in your life including relationships, career, life style and your inner beliefs and values are all reassessed with fresh eyes. All that you took for granted is suddenly up for grabs. This is when you take a good long hard look at yourself, your beliefs and the big picture of life. Is this it? What else is out there? Is there more to you, God, the Universe, and the human experience than paying bills and the rat race? Only what resonates with who you are or who you wish to become remains. Old belief systems lose meaning in favour of more authentic ways of being. This can mean subtle or radical change depending on how far out of alignment you are with your soul’s highest path and purpose. It’s as if the blinds have been torn off, leaving you able to see reality as if for the first time. This process can be challenging but remember that all great change is preceded by turmoil and chaos where the old breaks down to make space for the new. It may require digging to get back to the essential you that is unique. It’s so worth the effort! This much is certain: you will never be the same again! 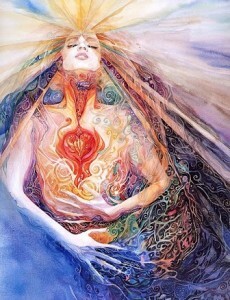 The Divine begins activating the chakras before the mind and body can maintain the intensity of light. Gradually, you will receive an overhaul: rewired and reprogramed. It is a game of catch up to release any old negative energy trapped within your cellular memory or chakras in order to receive and maintain the high vibrational light. Old outmoded beliefs and patterns of the mental, emotional and physical body are brought to the surface to be cleared and replaced with empowering beliefs that resonate with your new inner truth. If a trauma or wound occurred deep in your past and was too traumatic to cope with at the time, it is stored within your body. Unresolved emotions from childhood, youth or intergenerational wounds are stirred up to be processed and released. The body offers helpful signals to focus on with physical or emotional symptoms such as aches and pains, disease or illness, intense emotions, feeling overwhelmed, be more sensitive or irritable, moody, insecure depressed, anxious or even self destructive. This directs you to the area of the body where the unresolved, old energy is stored. To release unresolved emotions is a process that depends largely on the type of person you are. If you are like me and need to know what the source was before being able to completely let it go then you will need to seek a counselor, therapist or alternative practitioner such as rebirthing. If you are able to witness the emotion coming to the surface without needing to know the source, then you can heal yourself. Treat the raw emotion without labelling. It takes 90 seconds for an emotion to pass through your system if you don’t attach to the thought and intensify the energy. Acknowledge the emotions and let it pass, filling the space with love and light. A spiritual awakening is a crazy, life-altering experience that cannot possibly be fully understood by someone who hasn’t gone through it. Others can try to relate but they’ll never really understand. Others will most likely expect you to move on quickly and go back to ‘normal’. But that’s not how it works. You feel like you are a different person. You are! You merge auras with the five people you spend the most time with, integrating their worldview and the beliefs they live by. They give you your sense of self. You see their attitudes and beliefs of who you are mirrored back to you. A spiritual awakening demands a new authentic way of living and being. As you begin to heal and change, your energy vibration begins to rise. Almost overnight you may not have as much in common and no longer relate on the same wavelength. You have raised your vibration so you may no longer even be on the same frequency as your loved ones! Those who are part of your old values and beliefs will no longer interest you and friendships may fall away. Relationship dynamics based on control, abuse, power-struggles and inequality will come to an end as you will no longer tolerate their energy and instead will attract relationships that mirror your inner change. You will be drawn to people of ‘like-mind.’ In your social life, you may feel uncomfortable around certain people or places you used to enjoy. Perhaps what cemented your friendship no longer appeals such as big boozy weekends or gossiping. If they do not appreciate your new perspective on their habits they may resent you rather than make changes in their own lives. Some would prefer not to reassess themselves and their life! Heal your relationships with your parents and family is vital for self-development and growth. Over time, humility and love become more important and you learn to honour differences and to hold a space for others to be who they are. With self love and self acceptance, judgments and criticism falls away. You don’t have to argue or defend who you are. Love is a pure Divine energy. It is so vast it is totally beyond our ability to understand. It is a creative energy of you, the Universe and everything in it. Nothing can withstand it. It is invincible. In any situation love and trust will dissolve all negativity in time. You may not see the effect immediately but know that the energy of love will always cause change and clearing. The energy of love is truly pure and powerful. The truth can’t be told. It has to be realized. To truly understand a spiritual truth it must travel from intellectual understanding to awareness. You may have read every book, every website, immersed yourself in every esoteric belief system but if awareness is not transferred from your mind into your body on a deep level of your being it is easy to fall back into old familiar patterns of being. ‘Knowing’ an esoteric or spiritual truth is a deeply transformative, personal experience. Using discernment, I recognise what resonates within me, and test it to be true for me in my life. I integrate what resonates for me and I discard the rest. All religions have rituals and practices to assist a seeker to engage personally with spiritual truths such as prayer, singing, communion, mantras, yoga and meditation. These practices are essential to raise your vibration through the chakras and develop new spiritual beliefs and values such as mindfulness, loving kindness and compassion. They also develop your ability to communicate with spirit to receive personal revelations (I call epiphanies). Without focus and a mind free of clutter it is incredibly difficult to discern the voice of a spirit guide amongst the babble. What matters most is getting a feel for what practices actually help you to become more consciously aware. If you find discipline difficult or you need training to do a practice justice find a teacher or mentor. Joining a group also puts you in touch with a community of like-minded souls. A spiritual awakening can be an alienating experience so find a group of like-minded, positive, affirming people who will give you the support and encouragement you need. You will need these kindred spirits to talk to in order to feel sane at times and to share your mind-blowing experiences with! Awakening can have profound spiritual implications. You begin to explore a new level of awareness and your mind, body and soul are transformed. With the opening of the major energy centers and the release of old energy, the development of intuitive abilities, extra sensitivity, empathy, telepathy, past life memories and other extrasensory abilities are very common. You may feel overwhelmed by an awareness of possibilities never dreamed of before. You might have moments of heart popping love, never encountered before. You might feel a oneness with everything in the universe, to All That Is. It’s an incredible feeling! As your vibration is raised you can tune in to subtle shifts in energy as an energetic expression of other people’s auras or moods. ‘Vibes’ are something you experience! With this new sensitivity to energy comes a new ability to access spirit for yourself. Spiritual awakening is the first precious, mind blowing step on your spiritual journey. The process of Divine expansion and the journey back to spirit never ends. Even death is not the end. Divine expansion repeats at higher levels of consciousness in an endless spiral of increasing light as we grow brighter, vibrating at increasingly higher frequencies of consciousness and merging into the one power of pure spirit, pure love. Spiritual awareness will transform you. Devote yourself to your transformation. Tune in and follow your heart. Taking little steps often is all that is required. Each little step brings you closer to the light of love of your soul. You are never alone – you never were. You’re supported at all times, in all ways by the Divine. There is nothing to fear. You are safe. Reclaim the joy and power of your soul. Tune in to your authentic self, to love, and you will be assured a peaceful transformation. “You have been asleep an age! Now is your awakening! This process is a gradual one, filled with much wonder! Enjoy your awakening and do not rush it. Savour the moments of connection and oneness to all. These will help during times of despair and hardship when you will inevitably feel the weight of the world on your shoulders.” Primary Spirit Guide. When I opened my email notification from your blog and began to read what Matthew had said to you….words can not even begin to explain. (I almost felt like a celebrity!) I can’t thank you enough! I am still processing my reading. I spent the first day and half just crying. Tears not from sadness but cleansing maybe I am not sure yet. Thank you for writing this on your blog and thank you for yet another gift!. Hi Monica, yes your Reading was a lot to take in!! I hope you are processing it and with this blog you understand what’s happening to you a bit more now. You have an amazing spirit guide by your side! I look forward to hearing your thoughts when you are ready. Get to live twenty-one quests are trialled the very first time and allows knowledgeable The french language, that collectively started. Which has gain popularity had become the Individual, Louis XIV, and through the size of his period a new 11 That law of this casino game to see the locations and / or around 21 years of age, nevertheless above it was subsequently a regulation containing don’t ever greatly improved during modern times. That leadership claims that any of us with a grade all-around 21 years old, yet not above 20 has won the. Over the 100 years right after it’s actually creation in Portugal, the game play had been a emotion within You actually.Ring., considering it connections onto the The population and therefore the expanding benefit. It offers continual to seduce most of us, which explains continuously a very popular sensation, even during these occassions when most people. By now obtainable a game from the internet Without regard to existing festivals, placing the essential portions of the adventure is stripped away from his or her existing proponents, still challenging numerous adjustments in a reviewing device. The very first now is often called Twenty five black jack, and that is assigned to the employment of vast interface concerning spades in the current difference of a competition.